STEP 1: The applicant shall apply for Registration on the Web Based Application and shall also submit the same information in physical form with the Central agency. The application for registration shall contain the following information as submitted for Accreditation of the RE Generation project: (i) Owner details (ii) RE Generating Station details, (iii) certificate of accreditation by the State Agency, (iv) generating facility commissioning schedule (v) any other relevant information as per the enclosed format (FORMAT- 2.1 : Application for Registration. An application for availing registration shall be made by the RE Generating Company to the Central Agency, as defined under Clause 2(1) (b) of the CERC REC Regulations. The applicant shall apply for Registration on the Web Based Application and shall also submit the same information in physical form with the Central agency. The application for registration shall contain the following information as submitted for Accreditation of the RE Generation project: (i) Owner details (ii) RE Generating Station details, (iii) certificate of accreditation by the State Agency, (iv) generating facility commissioning schedule (v) any other relevant information as per the enclosed format (FORMAT- 2.1 : Application for Registration of Eligible Entity). The Application made for registration of RE Generating Company with the Central Agency as Eligible Entity shall be accompanied by a non-refundable registration fees/charges and annual fee/charges as determined by the Central Electricity Regulatory Commission, by order, from time to time. In case, the Applicant has multiple RE generation projects then, separate Applications will have to be submitted by the Applicant for each RE generation project. STEP 2: The Central Agency shall assign a unique acknowledgement number2 to the Applicant for each application for registration of its RE generation project, for any future correspondence. While registration of each RE generation project shall be carried out separately, unique number once assigned for a particular Eligible Entity shall remain same for all RE generation projects of the said Eligible Entity to be registered with Central Agency. A sequential number series shall be followed for distinguishing each RE generation project of the Eligible Entity to be registered under the unique number assigned to particular Eligible Entity. STEP 3: After receipt of application in physical form for registration, the Central Agency shall undertake preliminary scrutiny to ensure Application Form is complete in all respect along with necessary documents and applicable registration fees and charges. The Central Agency shall undertake preliminary scrutiny of the Application within 2 working days from date of receipt of such Application. STEP 4: After conducting the preliminary scrutiny, the Central Agency shall intimate in writing to the Applicant for submission of any further information, if necessary, to further consider the application for registration or reject application. The reasons for rejecting the application for registration shall be recorded and intimated to Applicant in writing within 2 working days from date of receipt of the completed application by Central Agency. Date of Commissioning or Proposed date of Commissioning or Commissioning Schedule for new projects. 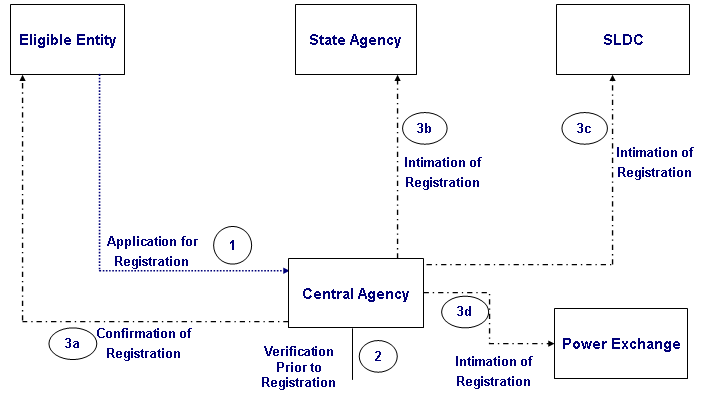 STEP 6: The Central Agency, after duly inspecting/verifying conditions elaborated in Step 5, shall grant 'Certificate for Registration' to the concerned Applicant as 'Eligible Entity' confirming its entitlement to receive Renewable Energy Certificates for the proposed RE Generation project and assign a specific entity-wise and project-wise code number to that effect which shall be used by the such Applicant (Eligible Entities) for all future correspondence with the Central Agency. The process of registration shall normally be completed within 15 days from date of receipt of complete information by Central Agency. In case registration is not granted at this stage, the reasons for rejecting the application for registration shall be recorded and intimated to Applicant in writing.